I can’t believe I’ve been blogging here at Mom Fuse for over 7 years now. Seven years – that’s crazy! There has been a few ups and downs, we’ve been able to try some really cool products, I get to write for a living and it’s made it possible for me to stay at home with the kids which is priceless. I will admit, when I first started bloggin I wasn’t into scheduling posts or keeping track of stats and whatnot but then my curiosity got the best of me and I became interested and started keeping an eye on things more closely. I’ve also kept my list of favorite blogging resources (which you can see here) that I use to keep my blog going and programs that help me make it a better blog. One of the tools I’m deeply in love with is CoSchedule. I have been using CoSchedule as my social media calendar and for keeping track of the upcoming posts I have scheduled here at Mom Fuse. 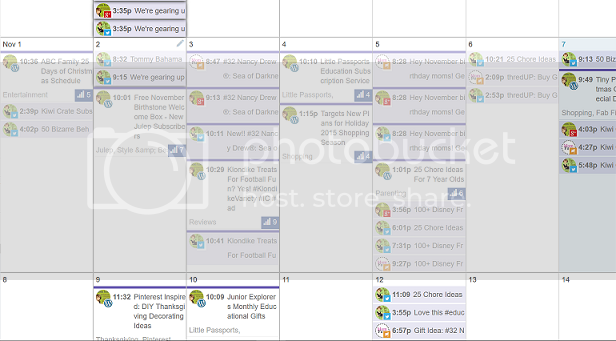 Yep – that’s a glance at my blogging calendar and that’s really a very slow week. Once we get into the holidays and and the busier weeks it gets a little crazy which is why I love this tool so much. At a glance I can see everything I need to, stay organized and keep my insanity. 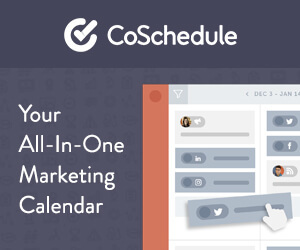 CoSchedule is an all-in-one marketing calendar that brings your content and social media together so you can see it all in one place. But it also does so much more! It’s drag-and-drop calendar makes it so easy to use and the plugin allows you to save a ton of time all while helping you your blogging traffic by scheduling social media promotion right from your post. I could go into so many details and praise of the above features, but I know you have things to do, I have things… So this video will be quicker and shows you a good understanding of some different things CoSchedule can do for you. I can run the CoSchedule editorial calendar as a plugin, on my post editing screen, or even on CoSchedule.com. I can schedule social media as I blog or when the inspiration hits me – this helps me not to forget to share with my social media fans. It’s drag and drop so I can easily plan and move blog posts and social media shares around as my schedule changes. I can share my posts posts with the major social networks like Twitter, Facebook, LinkedIn, Buffer, and even Google+ Pages. Instead of losing track of my draft posts in WordPress CoSchedule offers a nice looking drafts bin. CoSchedule is one of the best things that happened to be in a blogging aspect. It’s really helped me look at my social media stats and has helped made be a better blogger by getting more organized and being more social media minded. You can sign up for a FREE 14-day trial (no credit card needed) and then decide if it’s right for you. It really didn’t take me very long to decide I needed this in my blogging life and I hope you feel the same once you test drive it.